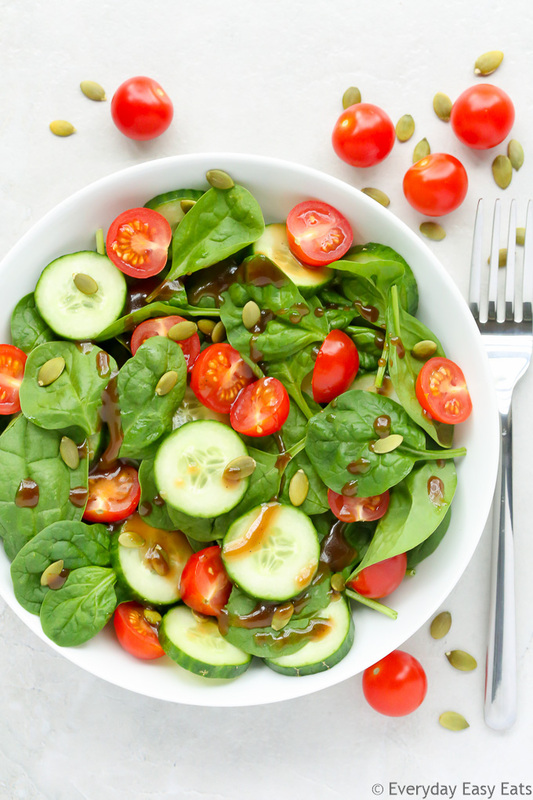 This Strawberry Spinach Salad recipe is quick, easy to make and topped with a heavenly honey balsamic vinaigrette. It is the perfect summertime salad! This crisp, refreshing salad is sure to be one your favorites, because it uses fresh, basic ingredients and takes only 10 minutes to make. This salad is ideal for entertaining or bringing along to a potluck or a summer barbecue. Not only that, it is made with a nutritious combination of ingredients that taste amazing together. This simple salad is made with fresh baby spinach, strawberries, thinly sliced red onion and almonds, tossed in a delectable honey balsamic vinaigrette. Spinach is a great leafy green to always have on hand in your refrigerator. It is an excellent source of Vitamin K, Vitamin A and folic acid. Strawberries are also fantastic to have on hand because they are, obviously, so flavorful, and they are rich in antioxidants and Vitamin C.
1. When preparing the dressing, shake the ingredients together in a jar rather than whisking them in a bowl. The vinaigrette will combine much more easily that way. 2. If you are making this salad in advance for a get-together, do not add the dressing until you are ready to serve. This will prevent the salad from becoming soggy. A quick, super flavorful salad made with fresh baby spinach, strawberries, thinly sliced red onion and almonds, dressed in a delicious honey balsamic vinaigrette. Love this! Strawberries in salad with a balsamic vinaigrette is an all-time favorite of mine! Thank you Laura! Same here, strawberries + balsamic is a powerhouse combo! 🙂 Have a great week my dear!